Some programming magic by Harvey Harrison and Matt Chudleigh has resulted in a major increase in JaamSim's execution speed for release 2014-35. The following graph show the latest result for Benchmark 1 compared to those in my previous posts. 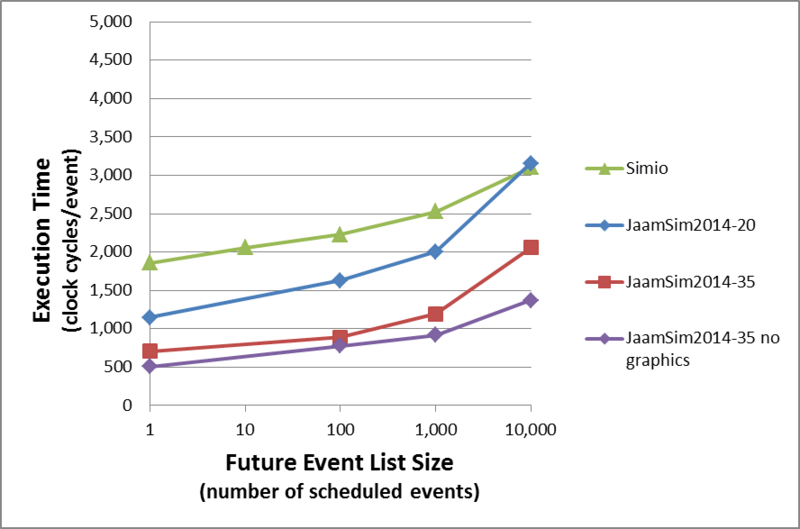 The bottom line on the graph is the result for JaamSim2014-35 with the graphics for the EntityDelay object turned off. Normally, EntityDelay shows the various entities moving along a line representing the fraction of time completed for each delay. Unfortunately, this graphic requires the data for each entity to be stored in a HashMap, adding considerable overhead unrelated to scheduling and executing events. A more realistic benchmark is obtained when this overhead is turned off. A practical example of JaamSim's speed advantage was revealed a few weeks ago when we delivered a very complex supply chain model to a mining industry client for their internal use. The model was prepared in our TLS software -- an add-on to JaamSim. The TLS model required only 7 minutes to complete a simulation run, while the less-detailed Arena model it replaced required 35 minutes. Our client was very pleased by this unexpected boost to his productivity. Selecting a name for a new software product such as JaamSim can be a vexing process. Names are important -- a rose by any other name might smell as sweet -- but it would not sell very well if was hard to pronounce or evoked something negative. The Igor Naming Guide provided some excellent advice, but it was hard to put it into practice. We thought of all sorts of clever, evocative names only to find that they had been used twice over or that someone was already sitting on the .com domain name. Even the names we had rejected as being too dumb or cute had been used already. According to Igor, an acronym is one of the worst possible ways to name something. However, we were getting desperate and the name JamSim -- "Java Animation, Modeling, and Simulation" seemed promising. That is, it did until a Google search showed that it had already been used for "Java MicroSimulation". The jamsim.com domain name was available, but there were too many references to JamSim for this name to be a viable option. How about "JaamSim" then? "The whole world was said to be reflected in it, and divinations within the cup were said to reveal deep truths." This was great! I had been interested in Persian culture ever since reading The Rubáiyát of Omar Khayyám at an impressionable age. The idea that our software might "reveal deep truths" had me hooked, so the name "JaamSim" won out in the end. Now that you know the story of its name, perhaps JaamSim will help you to reveal your own deep truths.